This is the best of all worlds, shopping fabulous items for a very good cause. I attended last year and was sorry that I ran out of retail time so going to be the first in line! The 2018 Shop The Day Away Luncheon™ features Palm Beach’s most fabulous silent auction featuring more than 600 new luxury designer items from the world’s finest designers and luxury brands, including an amazing selection of new handbags, accessories, jewelry, evening, home, cashmere, beauty, and more. With the wonderful Lara Bush as the Keynote Speaker, the day could not be more divine. The photo of the elegant philanthropists who have pooled their talents in creating an extraordinary shopping and giving experience, inspired us. 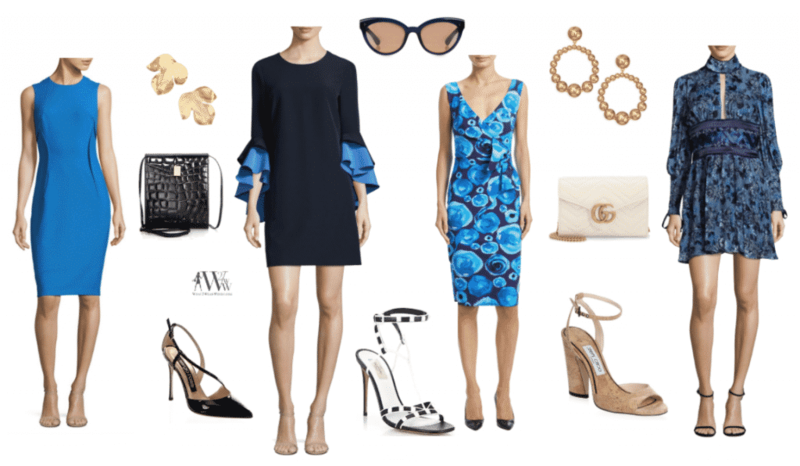 So for what to wear to a charity luncheon, we took our cue from the vivid’s blues of the invitation and went shopping at Saks.com for an assortment of styles just right for every mood, from fun to feminine to fanciful. Pair with shoes and bags from the latest collections and you have the perfect ensemble to go from day to night with absolute ease and in classic style.